When I put together the outline for my very first valuation class in 1986, I was warned by a senior faculty member not to go down that path. I was told that there was really not enough theory in valuation to warrant a class and that I would end up teaching a glorified accounting class. I chose to ignore that advice and I have not regretted it since, for two reasons. The first is that I love teaching a subject where there is little theory, the questions are entirely about practice, you draw on a unique blend of skills and tools to accomplish your tasks and the market acts as your task master. The second is that I have learned almost everything I know about valuation and more importantly, how much I don't know, in the process of teaching this class. This post is about one of the recurring themes in my class which is the interplay between narratives and numbers that makes for a good valuation. Accounting statements provide me with the raw material for my valuation, nothing more and nothing less. Like all raw material, I have to decide what I will use and what I will discard, and I discard far more than I use. As the end user of the raw material, I get to determine what makes sense for me and what does not and not GAAP, IFRS or the accounting profession. As for fair value accounting, I am sympathetic with the motives (which is to make accounting more relevant) but unimpressed with the results. To me, fair value accounting estimates are like microwave frozen dinners, quick and convenient, but you will never mistake them for the real thing. Excel (or Numbers) is a versatile and powerful multi-purpose tool, but like all tools, it can be misused or over used. My knowledge of Excel is limited to those parts of it that help me complete my valuation and I frankly have no interest in expending time and resources mastering the parts that I can get done with simpler tools or none at all. So, why do so many appraisers and analysts emphasize their mastery (at least in their minds) of the numbers side of valuation? The answer, I think, lies in the trifecta of illusions that go with numbers-based models. The illusion of precision: For better or worse, we seem to feel better about uncertain outcomes, if we can attach numbers (expected values, risk adjusted discount rates) to them. That, by itself, is healthy but what is unhealthy is the belief that quantifying risk somehow makes it dissipate. The illusion of objectivity: I believe that all valuations are biased, with the only questions being how much bias and in what direction. That is because we bring in our preconceptions and beliefs about companies into our valuations and we sometimes add to the bias because we have other agendas at play. Here again, analysts point to numbers as their defense against the bias charge, with the implicit argument that numbers don't lie, when the most effective way to shade the truth is with a selective use of numbers. The illusion of control: I believe that "numbers people" often use numbers to intimidate "non-numbers people" into mute acceptance. The intimidation factor is dialed up by adding more detail (500 line items, anyone?) and buzz words (free cash flow, a few greek alphabets and a host of acronyms) to your valuations. In my view, there are at least three significant dangers, when numbers are used without any narrative (or story line) in constructing valuations. First, valuations become plug-and-point exercises, tools to advance sales pitches or confirm pre-conceived values. Second, if a valuation is built around line items and individual inputs, there is a strong possibility that you may be creating a business that can exist only in spreadsheet nirvana, where revenues double every year, margins expand without challenge and growth comes without significant reinvestment. Finally, discussions and debates about inputs become shallow exercises in quibbling about the "right" values to use, with no logical tie breaker. If one extreme of the numbers/narrative spectrum is inhabited by those who are slaves to the numbers, at the other extreme are those who not only don't trust numbers but don't use them. Instead, they rely entirely on narrative to justify investments and valuations. Their motivations for doing so are simple. Story telling is a powerful attention getter/keeper: Research in both psychology and business point to an undeniable fact. Human beings respond better to stories than to abstractions or numbers, and remember them for longer. After all, the Harvard Business School has taken story telling almost to an art form with its cases, tightly wound narratives that are supposed to convey larger lessons. Unrestrained creativity: "Creative" people through the ages have always fought back against any restraints on their creativity, especially those imposed by those that they view as less imaginative than they are. The Creative Superiority Complex: Just as numbers people intimidate with mounds of numbers, good narrators can browbeat "bean counters" with superior story telling, especially if they can back their stories up with personal experience. Narrative-driven investing is not uncommon, especially with younger firms and start-ups, and I have been taken to task for even trying to value these companies using number-driven models. Paraphrasing some of the comments on my valuations of Twitter and Uber, the argument seems to be that while cash flow based valuations may work on Wall Street and with mature companies, they are not useful in analyzing the type of companies that venture capitalists look at. While it is true that rigid cash flow based models will not work with companies where promise and potential are what is driving value, staying with just narrative exposes you to two significant risks. The first is that, without constraints, creativity can carry you to the outer realms of reason and into fantasy. While that may be an admirable quality in a painter or a writer, it is a dangerous one for an investor. The second is that, when running a business as a manager or monitoring it as an investor, you need measures of whether you are on the right path, no matter where your business is in its life cycle. When narrative alone drives valuation and investing, there are no yard sticks to use to see whether you are on track, and if not, what you need to do to get back on the right path. If numbers without narrative is just modeling and narrative without numbers is story telling, the solution, as I see it, is both obvious and difficult to put into practice. In a good valuation, the numbers are bound together by a coherent narrative and story telling is kept grounded with numbers. Implementing this solution does require work and I would suggest a five-step process, though I am not rigid about the sequencing. Step 1: Develop a narrative for the business that you are valuing or considering investing in: Every business has a story line and the place to start a valuation is with that narrative. While managers and founders get to present their narrative first, and some of them are more persuasive and credible than others, you and I have to develop our own narratives, sometimes in sync with and sometimes at odds with the management story line. As an example, in my valuation of Uber, my narrative was this: Uber is an innovative car service company, with the untested potential to expand into other logistics businesses. It will expand the car service business (by attracting new users), while gaining a significant (though not dominant) market share and preserving its profitability. The counter narrative that some of you presented is the following (and I am paraphrasing): Uber is a logistics company that will find a way to expand its profitable car service business model into the moving, car rental and electric car businesses. Step 2: Test the narrative against history, experience and common sense: This is the stage at which you put your narrative through a reality test and examine whether it withstands multiple tests. The first is the test of history, where you look at the past to see if there have been companies that have lived the narrative that you are claiming for your company and what they share in common. The second is the test of experience, where you draw on investments based upon similar narratives that you have made in the past and remember or recognize road bumps and barriers that you ran into in practice. The third is the test of common sense, where you draw on first principles in economics and mathematics, to evaluate your narrative's weakest links. With Uber, here is how I justified my narrative. Uber will be able to gain (10%) is that the car service (taxi and limo) business is a splintered, regulated and inefficient business that is ripe for disruption. The reason I did not assume a dominant market share for Uber (40% or 50%) is because I don't see as large a networking effect in the car service business, where the service is both physical and localized, as there are in online technology businesses (search, merchandising or advertising). At the same time, I am assuming that Uber will be able to preserve its profitability in the face of competition and overcome regulatory hurdles. Step 4: Connect the drivers of value to a valuation: I use discounted cash flow models (DCF) to connect the drivers of value to value, because I am comfortable with the mechanics of these models. It is a tool that not everyone is comfortable with and you may find a different and perhaps better way to connect value drivers to value. 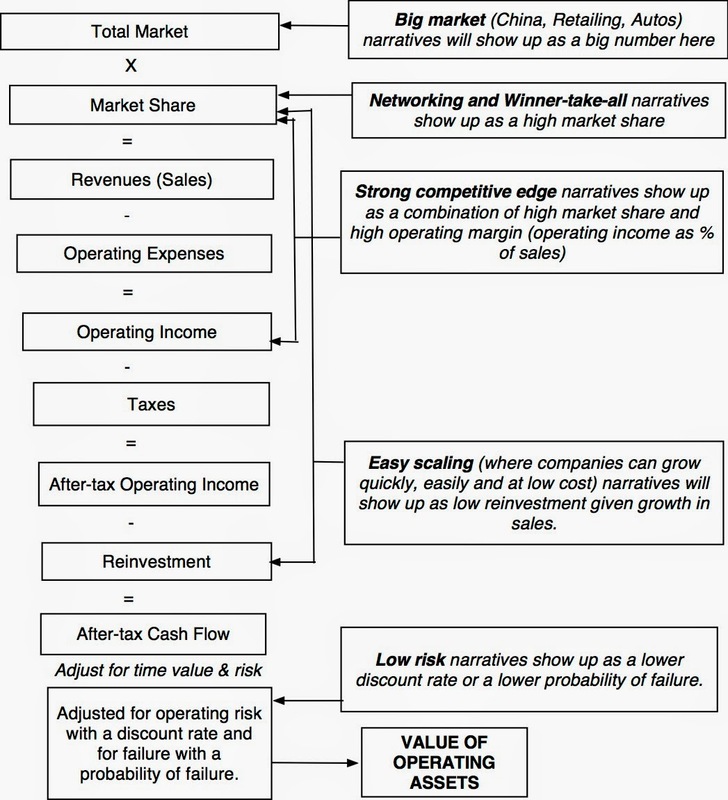 In fact, the classic VC valuation takes a short cut by using three drivers of value: an expected earnings (or revenue) in a future period, an exit multiple (based on what others seem to be willing to pay today for similar companies) that converts that number into a future value and a target return to discount that value back to the present (and adjust for risk). To those of you who have never done valuation before, trust me when I say that valuation at its core is simple and that anyone should be able o do it. If you don't believe me, you are welcome to try my online valuation class on iTunes U. It comes with a money back guarantee. Step 5: Keep the feedback loop open: My kids and spouse are quick to remind me that the three words that I find most difficult to say are "I was wrong" and I am sure that I am not alone in my reluctance. The biggest enemy that we (whether numbers or narrative driven) face is hubris, where we get locked into our initial points of views and view changing our minds as a sign of weakness. While it does not come easily to me, I do try to stay open to the possibility that as events unfold, my narrative will change or even shift, sometimes dramatically. With Uber, if the next few months bring evidence of tangible success of the business model in other logistics markets, I will change my story, expand the potential market and with it, the value. If, in contrast, the company gets bogged down in regulatory and legal fights in its existing car service markets or a competing service improves its offering dramatically, I will have to dial down my optimism, reduce both market share and profit margins and change value. In either case, I will view these changes as part of investing rather than as a failure in my initial valuation. In my experience, it is easiest to play to your strengths (which, for me, are on the numbers side), but you will gain the most when you work on your weaknesses (which, for me, are on the narrative side). Consequently, I learn more from listening to those who think differently from me and disagree with me, even if they do not always do so constructively, than I do from those who agree with me. On my Uber valuation, the comments that I found most useful in fine tuning my valuation were those that I heard from those in the venture capital and technology space. After telling me that I had no idea what I was talking about and that "DCF won't work for these companies", they then proceeded to give me ideas that I incorporated into my DCF valuation. Here, for instance, are my attempts to quantify four of the most common narratives I heard about Uber, and the consequences for value. Car service company, facing significant competitive and regulatory hurdles, forced to make trade off of lower profitability for market share. Logistics company with expansion of car service business model into other logistics businesses, while preserving profitability. There are two points I hope to make with this exercise. First, even the most imaginative and far-reaching narratives can and should be converted into numbers. So, let's retire the argument that some companies cannot be valued. Second, big differences in valuation almost always result from differing narratives about companies, not disagreements about the "small stuff". Finally, since this is a discussion of how best to marry narrative to numbers, I cannot pass the opportunity to plug Shark Tank, one of my favorite shows, where narrative (from those pitching their businesses) meets numbers (from the venture capitalists/investors who challenge the business models while bidding on them), generating both drama and humor. If you view value as narrative overlaid with numbers, there are implications for both the founders/managers of businesses and the investors in these firms. To attract capital, managers need to develop coherent narratives about the firms that they run, convey these narratives to investors/markets effectively, and act consistently. To manage that capital well, they need to identify value drivers, set yard sticks that measure how the narrative is unfolding and change in response to unforeseen events, both positive and negative. For investors, the lessons are just as profound. They need to find companies that have compelling narratives, convert these narratives into value and make sure that they are not paying too much. They need to spread their bets across several good narratives and be open to changes in narratives and numbers. It is true that having a great narrative and the numbers to back them up is not a guarantee of investment success. The best laid plans of mice and men can go to waste, but to not plan at all will guarantee that waste. Every market has a bubble machine, though it is less active in some periods than others, and that machine creates an ecosystem of metrics and experts, as well as warnings about bubbles about to burst, corrections to come and actions to take to protect yourself against the consequences. In periods like the current one, when the bubble machine is in over drive and you are confronted by "bubblers" with varying credibilities, motives and methods, you may find it useful to first categorize them into the following groups. The most widely used metric for detecting bubbles is the price earnings (PE) ratio, with variants thereof that claim to improve its predictive power. 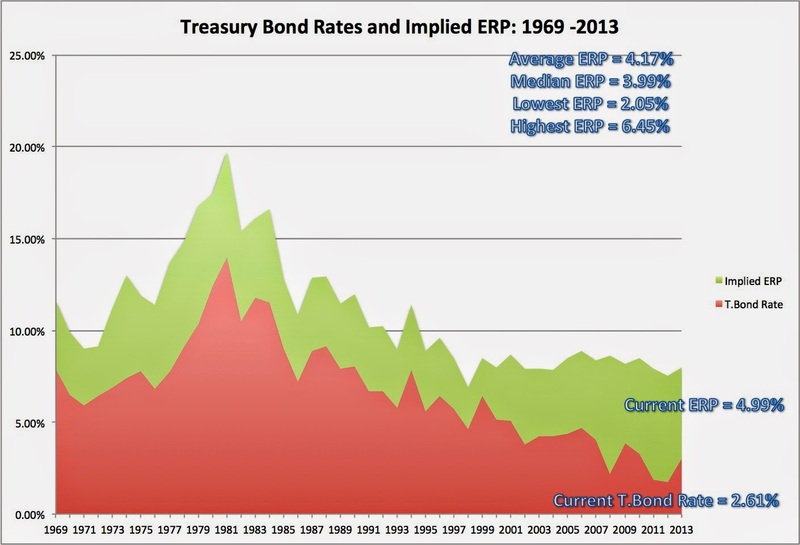 Thus, while the conventional PE ratio is estimated by dividing the current price (or index level) by earnings in the last year or twelve months, you could consider at least three modifications. The first is to clean up earnings removing what you view as extraordinary or non-operating items to come up with a better measure of operating earnings. In 2002, in the aftermath of accounting scandals, S&P started computing core earnings for US companies which can differ from reported earnings significantly. The second is to average earnings over a longer period (say five to ten years) to remove the year-to-year volatility in earnings. The third is to adjust the earnings from prior periods for inflation to get a inflation-consistent or real PE ratio. In fact, Robert Shiller has a time series of PE ratios for US stocks stretching back to 1871, that uses normalized, inflation-adjusted earnings. 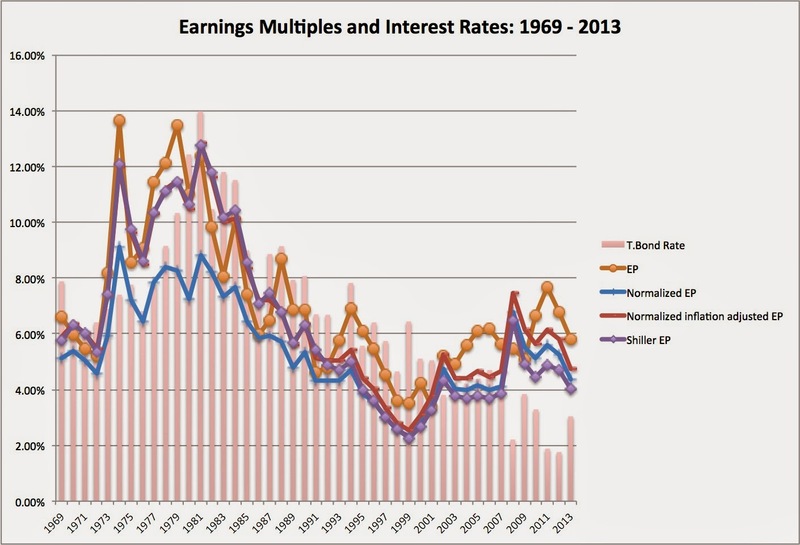 In the graph below, I report on the time trends between 1969 and 2013 in four variants of the PE ratios, a PE using trailing 12 month earnings (PE), a PE based upon the average earnings over the previous ten years (Normalized PE), a PE based upon my estimates of inflation-adjusted average earnings over the prior ten years (My CAPE) and the Shiller PE. To examine whether any of these PE measures do a good job of predicting future stock returns and thus market crashes, I computed the correlation of each PE measure with annual returns on the S&P 500 over one-year, two-year and three-year periods following the computation. 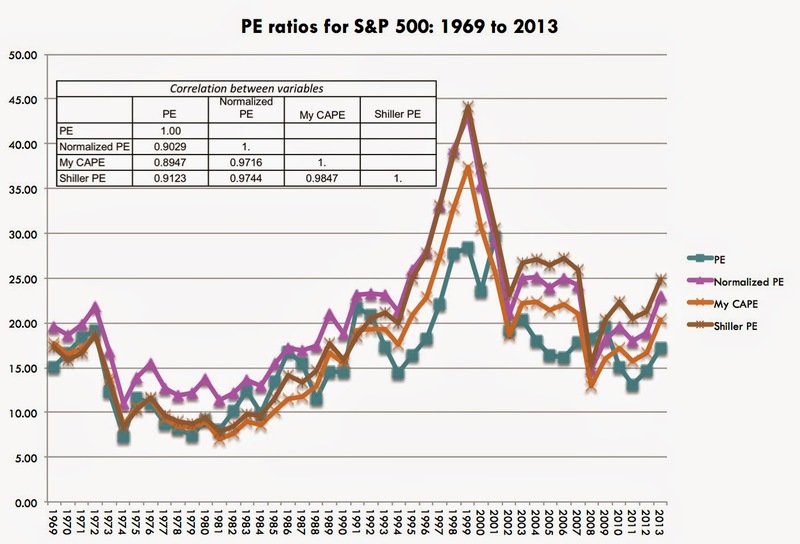 Defenders of the PE or one its variants will undoubtedly argue that you don't make money on correlations and that the use of PE is in detecting when stocks are over or under price. For instance, one rule of thumb suggests that a Shiller PE above 15 would indicate an over valued market, but that rule would have kept you out of US equities since 1988. To create a rule that is more reflecting of the 1969-2013 time period, I computed the 25th percentile, the median and the 75th percentile of each of the PE ratio measures for this period. The predictive power improves for PE ratios with this test, since returns in the years following high PE ratios are consistently lower than returns following low PE ratios. Normalizing the earnings does help, but more in detecting when stocks are cheap than when they are expensive. Finally, the inflation adjustment does nothing to improve predictive returns. It is true that this intrinsic value is a function of my assumptions, including the growth rate and the implied equity risk premium. You are welcome to download the spreadsheet and try your own variations. If you remain invested in equities (do nothing), even allowing for the market correction of 40% at the end of year 2, your expected value is $1.0672 at the end of the period. With a passive defense, you earn the risk free rate of 0.5% a year, for two years, and the end value for your portfolio is just slightly in excess of $1.01. With an active defense, where you sell short and invest int he risk free rate, your portfolio will increase to $1.3072, if a correction occurs, but the expected value of your portfolio is only $0.9528, which is $0.1144 less than your do-nothing strategy. The net payoff to acting on a bubble generates positive returns only if your conviction that a bubble exists is high (with a 20% probability, it almost never pays to act) and even with strong convictions, only if the market correction is expected to be large and occur quickly. On a personal note, I have never found a metric or metrics that allow me to have the combination of conviction that a bubble exists, that the correction will be large enough and/or that the correction will happen within a reasonable time frame, to be a market timer. Hence, I don't try! You may have a better metric than I do and if it yields more conclusive results than mine, you should be a market timer. Bubbles are not all bad: Bubbles do create damage but they do create change, often for the better. I do know that the much maligned dot-com bubble changed the way we live and do business. In fact, I agree with David Landes, an economic historian, when he asserts that "in this world, the optimists have it, not because they are always right, but because they are positive. Even when wrong, they are positive, and that is the way of achievement, correction, improvement, and success. Educated, eyes-open optimism pays; pessimism can only offer the empty consolation of being right." In market terms, I would rather have a market that is dominated by irrationally exuberant investors than one where prices are set by actuaries. Thus, while I would not invest in Tesla, Twitter or Uber at their existing prices, I am grateful that companies like these exist.